With the temps heating up, it's a great time to troll. Most fish and especially the larger fish have been holding deeper in the lake. If you have trolling rod and reel with lead core line, go down at 6-8 colors. Go deeper if needed. You can never go wrong with the old reliable lures like Rapalas, Mira Shads and Needlefish. But the hottest lures right now is the Tasmanian Devils. We have created a 4 pack with the top colors at Convict Lake (Black Thunder, Bleeding Flog, Bloody Ripper & Yellow Sunset). All the lures in the pack are 13.5 grams. The pack comes with hooks and beads. To complete your deadly trolling rig, soak the Tasmanian Devils with some Pro Cure Super Gel. If you don't have a trolling rod and reel with lead core line, we have you covered. At the general store we packaged trolling combos (rod/reel) with the lead core line and leader. The trolling combos start at $99+tax. 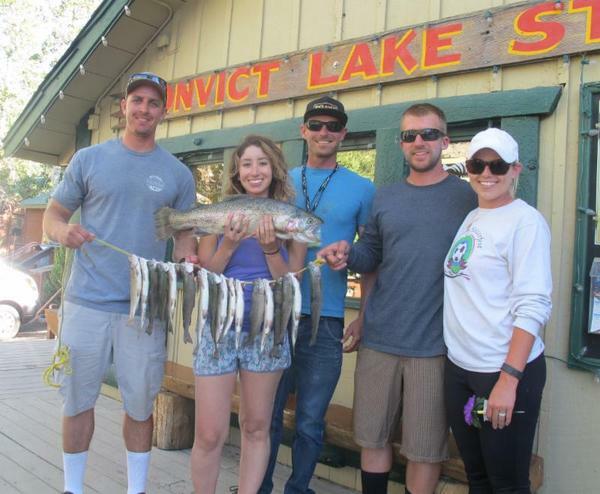 Catch of the Week: Jessica Romero and the crew from Dublin, CA with a full stringer and the "Catch of the Week". Jessica's fish was a 6 pound 6 ounce Rainbow caught with a Green Tasmanian Devil. Nice catch, Jessica! Heinz Sackreuter from Wofford Heights, CA with a fat 4 pound Rainbow. He was fishing the South Shore using Rainbow Powerbait. Maritza Sonnenburg of Grand Terrance, CA hooked into a 3 pound 9 ounce Rainbow using an Excel Lure. She was fishing near the Inlet. She caught the largest fish among her family. Bill and Jeremy Sonnenburg landed a 2 pound 5 ounce, 2 pound 10 ounce and a 2 pound 5 ounce respectfully. All using an Excel Lure. 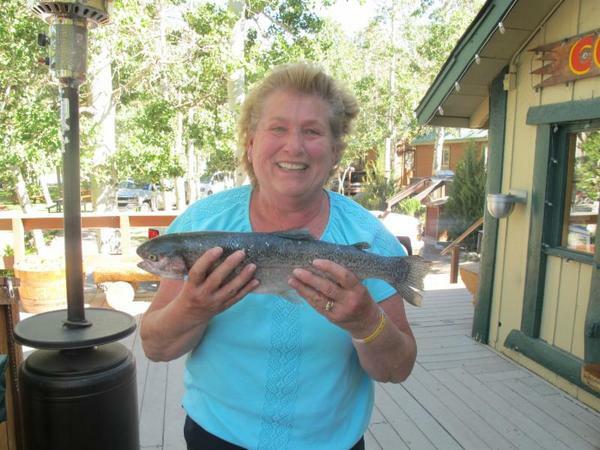 Jo Ann Ferjo from Upland, CA landed a 3 pound 7 ounce Rainbow. She was fishing the South Shore using Rainbow Powerbait. Tactics/Bait: Thomas Buoyants, Tasmanian Devils, Needlefish and Excel were the hot lures this week. Besides Powerbait, both nightcrawlers and Pinched Crawlers were the hot baits. The top Powerbait color was Rainbow. Salmon eggs were also reported to be working well in the creek and lake. The hot locations this week were the South Shore and Inlet. Alternative locations to try would be the North Shore, Jetty/Outlet Area and Hangman's Tree. Weather: The forecast has mostly sunny skies at the start of next week and warm throughout. The high temps starting Monday will be in the mid-80s and the lows will be in the mid-50s. Here is the National Weather Service link that is usually quite accurate: 7-Day Forecast Convict Lake. Sunrise - Sunset: Sunrise this week 5:53am - 5:57am and Sunset 8:12pm - 8:08pm. 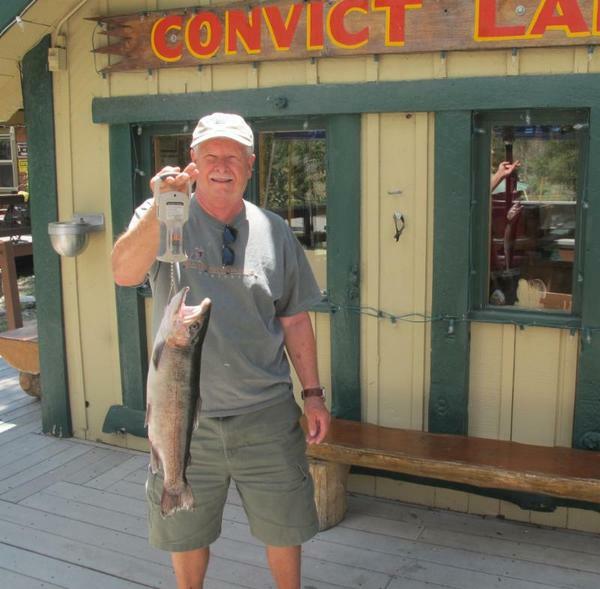 Stocking: Mono County stocked trophy trout in the lake on Tuesday, July 19th. The DFW is scheduled to plant both the lake and creek the week of July 25th.